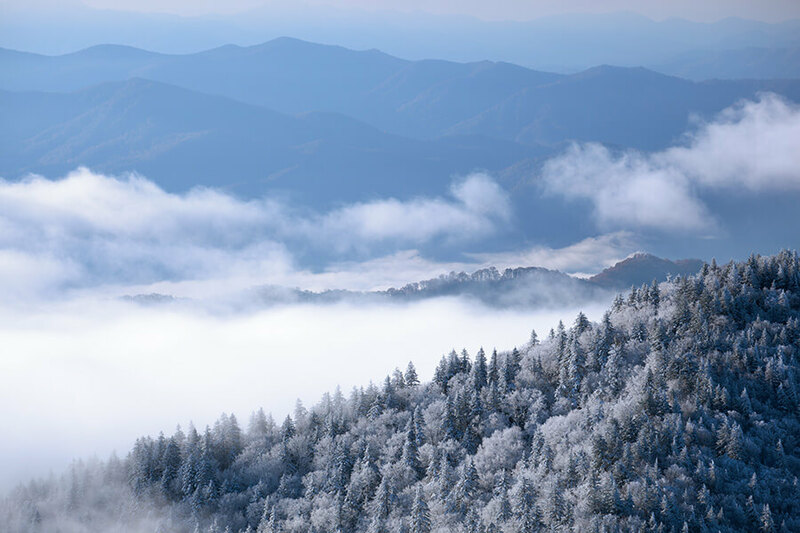 Winter brings a cold chill to the air, blankets the Smokies in snow, and gives visitors the opportunity to gear up with their stash of coats, gloves, and hats. There are plenty of things to do in the Smokies in Winter, and we’ve highlighted some of our favorite activities here for you. The slopes at Ober Gatlinburg open in December (weather determines the exact date), where visitors young and old can experience skiing and snowboarding. No experience? No worries! First-timers will need to have an introductory lesson. If you need a refresher course, both group sessions and private lessons are available for an additional fee. Snow tubing and ice skating (ice skating can be done year-round) are also fun ways to let loose and savor the winter. If you missed the fall foliage, a nice sprinkling of freshly fallen snow across the mountains is a sublime image to photograph. You also might be able to see historical structures that are typically hidden by the leaves throughout the year. Keep warm, dress in layers, and keep yourself hydrated if you plan on taking a winter hike. Road closures can happen, so make sure you keep an eye on the National Park Service website before you head out. Take the DryGo for a spin down one of the three courses. They hold up to three riders. Want to mix it up? The H2OGO is filled with warm water in winter so you can slip and slide down the hill. Outdoor Gravity Park has changing rooms on-site, so grab your swimsuit and towel and get rolling! Taking a spin on the classic Charles Dickens Tale, Sweet Fanny Adams Theatre in Gatlinburg creates a shortened version of “A Christmas Carol” and steps it up with additional features like a sing-along to popular Christmas carols. The show begins on Thanksgiving. Bluegrass music fills the Smoky Mountain Convention Center in Pigeon Forge each holiday during the Christmas in the Smokies Bluegrass Festival, founded by Lorraine Jordan. Besides the music, the event draws in craft vendors of all sorts. This dinner shows offers a feast fit for any holiday as well a lovely mix of entertainment and music. Enjoy the lively show at Dolly Parton’s Stampede with horses. The Christmas Show at the Comedy Barn is a mix of costumes, comedy, and music. You’ll also witness incredible dancing from the Comedy Barn Cloggers and a special performance by the Comedy Barn Canines. The Christmas Show begins on November 17, 2017, and runs through the end of the year with showtimes at 5 pm & 8:15 pm. They shut down for a week just to prepare this special experience for their guests! Beginning on November 4, Dollywood showcases over four million lights as part of its holiday offerings, sponsored by Humana. You can experience live shows, beautiful decorations, a nighty parade, and more through January 1, 2018. Even moonshine makes a holiday entrance! Ole Smoky brings out their Shine Nog and Pumpkin Pie moonshine. Sugarlands offers a 40 proof Pumpkin Spice Latte Sippin’ Cream, which is a perfect addition to a cup of coffee or hot cocoa. Pigeon Forge has a store exclusively dedicated to Christmas year-round (check out the Inn at Christmas Place for a decorated place to stay). You’ll find ornaments, collectibles, yummy fudge, nativity scenes, and beautiful designer Christmas trees within the store. Besides wines, did you know that Mill Bridge Winery has their own line of hard ciders and grape-cider blends? Grab some mulling spices to add to your wine and you’ll have a tasty addition to any festive party! Located in Walden’s Landing in Pigeon Forge, Smoky Mountain Popcorn is the perfect choice if you are looking for one spot to check out a variety of popcorn. They offer some festive flavors like Pumpkin Spice, Pumpkin Cheesecake, Hard Candy Christmas, Harvest Mix, and Kringle Crunch. Flavor offerings are sorted by popcorn mix type: cheese and savory, candied and caramel, chocolates, chocolates and nuts, and sour flavors. They also sell tins that make lovely gifts for any occasion. We hope you enjoyed our list of things to do in the Smokies in the Winter. Let us know if you have a favorite! Of course, you could also find a charming secluded cabin in the woods and cozy up next to the fire. Thanks so much for the information. We’re hoping to be there on December 26th for couple of nights.